Background Achieving better care at lower cost in the US healthcare safety net will require federally qualified health centres (FQHC) to implement new models of team-based population healthcare. Lean thinking may offer a way to reduce the financial risk of practice transformation while increasing the likelihood of sustained improvement. Objective To demonstrate system-level improvement in hypertension control in a large FQHC through the situational use of lean thinking and statistical process control. Setting Lynn Community Health Center, the third largest FQHC in Massachusetts, USA. Participants 4762 adult patients with a diagnosis of hypertension. Intervention First, we created an organisation-wide focus on hypertension. Second, we implemented a multicomponent hypertension care pathway. The lean tools of strategy deployment, standardised work, job instruction, Plan-Do-Study-Adjust, 5S and visual control were used to overcome specific obstacles in the implementation. Measurements The primary outcome was hypertension control, defined as last measured blood pressure <140/90. Statistical process control was used to establish baseline performance and assess special cause variation resulting from the two-step intervention. Results Hypertension control improved by 11.6% from a baseline of 66.8% to a 6 month average of 78.2%. Limitations Durability of system changes has not been demonstrated beyond the 14-month period of the intervention. The observed improvement may underestimate the effect size of the full hypertension care pathway, as two of the five steps have only been partially implemented. Conclusions Success factors included experienced improvement leaders, a focus on engaging front-line staff, the situational use of lean principles to make the work easier, better, faster and cheaper (in that order of emphasis), and the use of statistical process control to learn from variation. The challenge of transforming care delivery in the safety net warrants a closer look at the principles, relevance and potential impact of lean thinking in FQHCs. Achieving better outcomes at lower cost in the healthcare safety net is a critical driver for improving health and slowing the growth of healthcare costs nationally.1–7 The healthcare safety net refers to ‘providers that organize and deliver a significant level of both health care and other health-related services to the uninsured, Medicaid, and other vulnerable populations.’8 9 Federally qualified health centres (FQHC) are the preferred primary care provider (PCP) for over 25 million people in the safety net10 and have been shown to deliver higher quality care at lower cost.11–15 But in order to maximise Medicaid fee-for-service payments,16 17 FQHCs have developed care processes that emphasise increasing visit volume rather than improving population health.18 19 Medicaid’s recent experiments in value-based payments for accountable care organisations (ACO)20 21 help align financial incentives with higher value care for populations, but there is a timing problem: shared savings begin to accrue 12–18 months after costs are incurred for care redesign, putting the transition to new care models out of reach for many cash-strapped FQHCs.22–24 As a result, many FQHCs remain in a risk-averse position, unwilling or unable to make the investments needed for care transformation. Statistical process control (SPC) can augment the use of lean thinking in FQHCs by avoiding the twin problems of over-reacting to process noise inherent in the system and under-reacting to actual changes in system performance.38–41 In a resource-limited setting, SPC is especially valuable in helping teams quickly confirm the effect of process changes (in order to build on and spread improvements) without wasting time and increasing change fatigue by chasing insignificant variation. Despite the successful use of lean principles in many industries42–44 including healthcare,45–48 the current medical literature presents lean predominantly as a cost-cutting strategy that tends to undermine team cohesion, patient-centred care and professional autonomy.49–54 As a result, healthcare organisations may overlook the potential of lean thinking to achieve the ‘quadruple aim’55 by enabling joy in work for staff, better experience of care for patients, better health for populations and lower overall cost. The aims of this report are to: (1) demonstrate system-level improvement in hypertension control in a large FQHC contemplating a shift to Medicaid value-based payments; (2) describe the situation-specific use of lean thinking and SPC to engage teams in the design and implementation of a multicomponent hypertension care pathway; and (3) contribute to a fuller understanding of lean thinking as a leadership practice to engage people in purposeful, scientific problem solving—one that may have particular relevance for FQHCs seeking to transform care with limited financial resources. Lynn Community Health Center (LCHC) is the third largest FQHC in the state of Massachusetts serving 44 787 patients with >650 employees and an annual budget of $87 million. LCHC was founded in Lynn, MA, in 1962 as a behavioural health clinic in response to an identified community need. LCHC has grown to provide comprehensive integrated primary and behavioural healthcare, obstetrics, infectious diseases (HIV, tuberculosis, hepatitis C), addictions, dental, eye, elder services and homeless care at over 20 sites including 13 public schools in Lynn. Nearly 94% of LCHC’s patients live at or below 200% of the federal poverty level, 60.5% are enrolled in Medicaid, 82.3% belong to a racial/ethnic minority and 59.1% are best served in a language other than English.56 In September 2016, LCHC became 1 of 15 members in an all-FQHC ACO (the first of its kind in the USA) called the Community Care Cooperative (C3).57 C3 entered the pilot phase of Massachusetts’ Medicaid ACO58 beginning in December 2016 and expects to participate in the full ACO beginning in March 2018. With over 60% of its patients enrolled in Medicaid, LCHC’s top strategic priority in 2017 was preparing for the coming ACO, including transforming care processes to improve population health. LCHC’s lean journey began in October 2014, in response to the challenge of implementing a new electronic medical record system (Epic) while also improving and streamlining primary care workflows. LCHC hired a physician improvement leader to support this effort. A 6-month discovery and design process engaged 24 front-line team members to make the daily work of medical assistants, nurses and providers easier, better and faster. Three-day encounter closure rates increased from 60% to 95% on the day of Epic go-live, with gains sustained since May 2015. Despite changing nearly all team members’ workflows, no union grievances or staff complaints occurred, and morale across primary care improved. Following the success of Epic implementation, LCHC senior leadership embraced lean thinking as the health centre’s formal improvement strategy, hired a lean engineer with 10 years’ prior experience in healthcare, conducted a learning visit to ThedaCare in Wisconsin and developed a formal partnership with the Lean Enterprise Institute in Cambridge, MA. In May 2016, prior to the intervention, LCHC had 4762 adult patients (18–85 years old) with a known diagnosis of hypertension, of whom 3148 (66.8%) were controlled, defined as a last measured blood pressure <140/90. A planning document (online supplementary appendix figure 1) noted that there was no agreed practice standard for hypertension at LCHC, PCPs were responsible for all prescribing decisions, there was no standard process for population health outreach and there was no prior experience with SPC. Appropriate treatment of hypertension has been estimated to prevent one death for every 125 patients treated, one stroke for every 67 patients and one heart attack for every 100 patients.59 LCHC set a goal of improving hypertension control for 628 people (ie, 66.8% to >80% of LCHC’s patients with hypertension) and potentially preventing nine strokes, six heart attacks and five deaths. From a lean thinking perspective, this was the clear value for customer that defined our value-driven purpose for hypertension control and was communicated to our teams. We designed and implemented a two-step intervention to improve hypertension control: (1) In June 2016, LCHC created organisational focus around hypertension improvement using lean ‘strategy deployment’; and (2) In December 2016, LCHC implemented a multicomponent hypertension care pathway designed using lean principles. 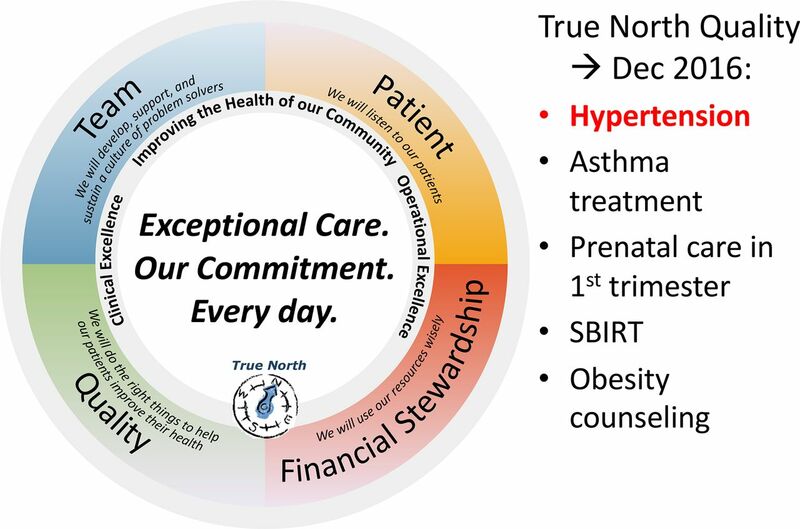 Lynn Community Health Center (LCHC) created a True North Compass to focus on ‘exceptional care, our commitment, every day’ through the four domains of: (1) Team—‘we will develop, support, and sustain a culture of problem solvers’; (2) Patient—‘we will listen to our patients’; (3) Quality—‘we will do the right things to help our patients improve their health’; and (4) Financial Stewardship—‘we will use our resources wisely.’ In fiscal year 2016 (FY2016), LCHC limited its focus to five quality targets, including hypertension. SBIRT, Screening, Brief Intervention, Response to Treatment. Five quality targets of varying difficulty were chosen with hypertension selected as a template chronic condition that would help LCHC establish a better system for population healthcare. The True North Compass and five quality areas were shared in an all staff meeting in June 2016, together with a renewed emphasis on the core mission of the organisation in the context of the coming Medicaid ACO. 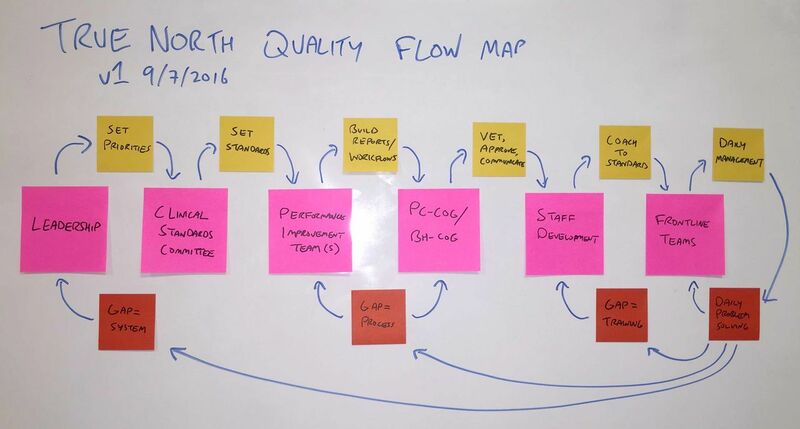 Lynn Community Health Center’s (LCHC) True North Quality Flow Map links strategic priorities to front-line teams and escalates system, process and training problems to the appropriate level of the organisation. Leadership sets the direction and target (eg, achieve hypertension control of ≥80% by 31 December 2017. A Clinical Standards Committee determines the relevant evidence-based practice standard. Performance improvement teams engage front-line staff to design and test workflows. The Primary Care Clinical Oversight Group (comprised of the medical directors and nurse managers of each of LCHC’s nine primary care teams) vets the workflows, votes to approve them for use across primary care and communicates the new standards to their teams. A staff development function coaches front-line team members to be able to practise the new standard reliably. A daily management system troubleshoots performance problems and routes training issues to staff development, process issues to the performance improvement team, or systems issues to senior leadership. This six-step process represents a version of the lean practice of ‘catchball’, in which key stakeholders cascade and negotiate goals and specific actions to meet those goals from the top of the organisation through to the front line. While Epic implementation had followed this six-step process, in general this way of working was new to LCHC. Easier (intuitive and easily understood, as little wasted motion as possible). Faster (shorten the time to achieving hypertension control at the patient and population level). Cheaper (near term by safely sharing the work with lower cost team members; long term by preventing emergency visits, hospitalisations and cardiovascular disease). 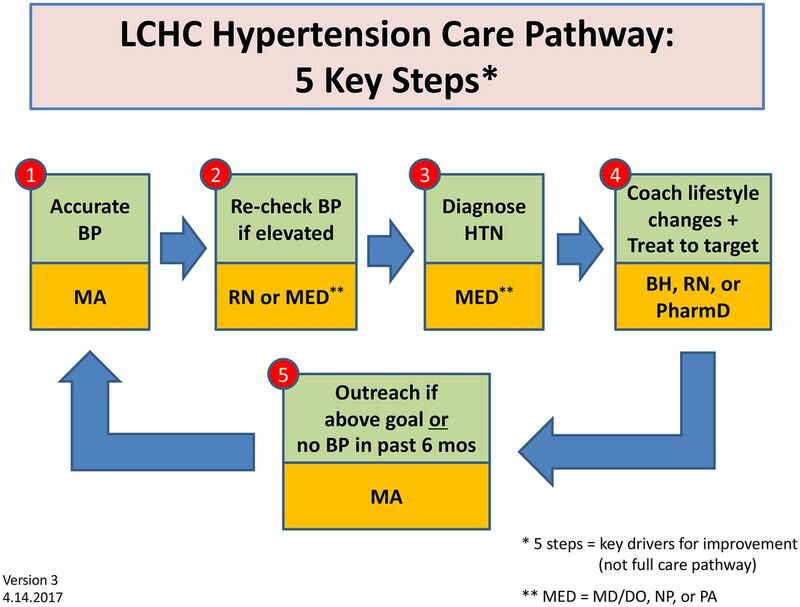 To address the challenge of consistent and straightforward communication across nearly 200 clinical staff in different care settings, a design team created a five-step framework for the LCHC Hypertension Care Pathway (figure 3), based on review of the medical literature and lessons learnt from a successful hypertension improvement effort at Virginia Mason Medical Center. This simple visual was used consistently and ubiquitously (in communications, during meetings, posted in clinical areas) to facilitate staff alignment and understanding of the essential steps in the care pathway. LCHC based its five-step hypertension care pathway on a review of the medical literature, including lessons learnt from a successful hypertension improvement effort at Virginia Mason Medical Center. This simple visual was used consistently and ubiquitously (in communications, during meetings, posted in clinical areas) to facilitate staff alignment and understanding of the essential steps in the care pathway. BH, behavioural health; BP, blood pressure; DO, Doctor of Osteopathy; HTN, hypertension; LCHC, Lynn Community Health Center; MA, medical assistant; MD, Doctor of Medicine; MED, medical provider; NP, nurse practitioner; PA, physician assistant ; RN, registered nurse. Five separate design teams (comprising a mix of clinical staff and front-line managers, facilitated by a physician improvement leader) designed, tested and iterated ‘standardized work’64–66 for each of the five key steps over a period of 6 months (see online supplementary appendix figures 3–6). The two purposes of this standardised work were to (1) facilitate training and maintenance of a consistent approach across LCHC, and (2) more readily recognise when the standard needed to be improved in order to meet the defined targets. Throughout the design process, the goals of easier, better, faster and cheaper (in that order of priority) were emphasised and the standards continuously iterated and improved. For example, the outreach team opted to use Epic’s Reporting Workbench because its direct integration into the electronic health record would avoid the need to shift between two systems (easier) and eliminate the possibility of transcription errors (better). Within Reporting Workbench, the hypertension registry was redesigned (online supplementary appendix figure 7) to remove visual clutter, reducing from 30 to 11 columns (easier). Embedded data links were selected to enable a team member to work intuitively from left to right, answering each question in the workflow in turn without needing to switch to a different screen (easier). The result of this process was a set of clear, intuitive and collaboratively designed workflows that clinical teams readily accepted as sensible ways to accomplish the organisation’s goal of improving hypertension control. We launched the LCHC Hypertension Care Pathway in December 2016 with an educational session on Eighth Joint National Committee standards for all PCPs and nurses, followed by in-service training for all clinical staff on how to accurately measure blood pressure (online supplementary appendix figure 4). To further facilitate effective and efficient training, we used the lean ‘job instruction’ method,66–68 which uses 1:1 coaching and observed practice over time to emphasise a limited number of key points (the critical elements that make or break the process) and the reasons why those key points matter. This initial launch was followed by several rounds of training on the outreach workflow from January through March 2017, followed by team-by-team implementation of nurse hypertension care pathway visits (in which nurses adjust up to three medications on the care pathway following PCP delegated orders) beginning in April 2017. The next problem to solve was how to recognise if the new standardised work was occurring as intended, and if so whether it was advancing the overall goal of controlling hypertension in LCHC’s population. A newly designed hypertension scorecard tracked five metrics corresponding to the primary outcome (hypertension control) and key process steps in the LCHC Hypertension Care Pathway (table 1). Hypertension control data were downloaded nightly from Epic to a data warehouse (DRVS) where they were accessible to clinical team members in near real time. A quality analyst abstracted data from Epic to create the process metrics for blood pressure recheck if elevated, hypertension visits by provider type and outreach. 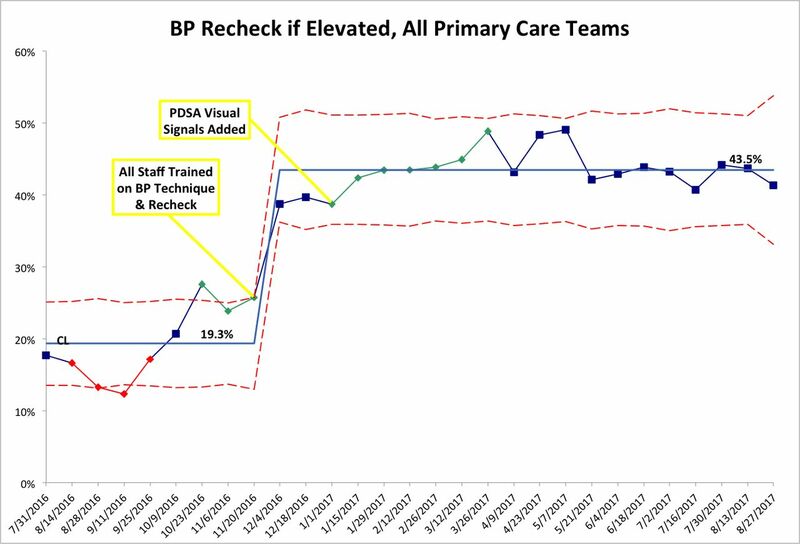 Staff training on hypertension workflows was tracked weekly during Primary Care Clinical Oversight Group meetings (online supplementary appendix figure 8). SPC was used to understand the effect of the two-step intervention on hypertension control, using the previous 24 months to establish baseline performance. The methods and application of SPC in healthcare have been thoroughly described.40 69–71 Attribute data with varying subgroup sizes were represented in P charts using QI Macros 2016 software. The Institute for Healthcare Improvement rules were used to differentiate special cause variation.69 Both system and team-level data were analysed to understand variation and correlation of cause and effect as teams implemented the hypertension care pathway at different times and with varying degrees of success. The physician improvement leader sent a monthly communication to all clinical staff and LCHC leadership with results and interpretation of the hypertension scorecard, noting special cause and likely correlation with teams’ improvement efforts. Clinical care consent was obtained from all patients at LCHC. All interventions followed evidence-based guidelines and were funded as part of usual clinical operations at LCHC. The Revised Standards for Quality Improvement Reporting Excellence 2.0 was used to prepare this report. Baseline hypertension control at LCHC from March 2014 through May 2016 averaged 66.8% (figure 4). Lower control rates from December 2014 through March 2015 (special cause attributed to a winter with record-breaking snowfall) were omitted from the baseline calculation to avoid overestimating the effect size of the intervention. (A) Lynn Community Health Center (LCHC) hypertension control, March 2014 to August 2017 (P chart). (B) Hypertension control by primary care team (P chart). (A, B) Statistical process control charts tracking hypertension control performance at the system and individual team levels were shared monthly with brief interpretation by the physician improvement leader. This helped teams understand the effect of implementing the LCHC Hypertension Control Pathway on improved performance. BP, blood pressure; CL, center line; HTN, hypertension; MSWA, Market Square/Western Avenue. In June 2016, step 1 of the intervention (organisation-wide focus on hypertension) resulted in an immediate improvement in hypertension control to 72.3%. From December 2016 through August 2017, step 2 of the intervention (implementation of a multicomponent hypertension care pathway) resulted in an aggregate increase in hypertension control to 78.2%. The overall improvement from baseline to the average of the most recent 6 months was 11.6%. Analysis of team-level data showed that six out of the seven adult primary care teams achieved special cause improvement during the intervention period. 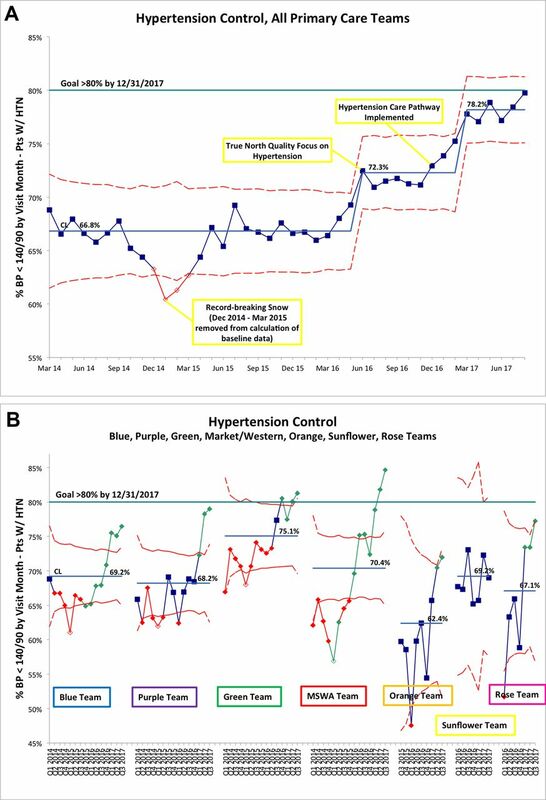 The improvement occurred at different times and was closely correlated with teams’ success at implementing various steps of the hypertension care pathway (figure 4). The process data facilitated several rounds of rapid cycle improvement. For example, initial blood pressure recheck rates were low, prompting an investigation into potential barriers. Two root causes were identified: (1) the correct blood pressure cuffs often were not available in the exam room; and (2) communication of elevated blood pressure was often omitted when medical assistants did not have time to talk with providers between visits. One series of Plan-Do-Study-Adjust (PDSA) cycles37 72–75 improved availability of correct blood pressure cuffs from 50%–70% to >95% (verified in random audits) by using the lean principle of ‘5S’76 77 to create a standard location for the four cuff sizes in all exam rooms (online supplementary appendix figure 9b). To facilitate communication of elevated blood pressure from medical assistants and provider recheck of blood pressure, a second PDSA series used the lean principle of ‘visual control’78–80 to create two additional signals of elevated blood pressure: a standard blood pressure column on the Epic clinical schedule (online supplementary appendix figure 10) and a red stop sign on the exam room door that the provider takes into the room and turns over to green after they recheck the pressure (online supplementary appendix figure 11). The result of both PDSA series was improvement in blood pressure recheck rates from 19.3% to 43.5% (figure 5). Blood pressure recheck if elevated (P chart). Statistical process control charts also tracked process steps within the Lynn Community Health Center (LCHC) Hypertension Care Pathway, for example, the rate of blood pressure recheck if the initial measurement was above 140/90. BP, blood pressure; CL Center Line, or Mean; PDSA, Plan-Do-Study-Adjust. Organisational focus on empowering and engaging front-line staff to understand the problem and design intuitive processes that made the work easier, better, faster and cheaper (in that order of emphasis). Situational, context-specific use of lean principles (eg, strategy deployment, standardised work, job instruction, PDSA, 5S, visual control). Use of SPC to learn from variation and facilitate the spread of improvement. The initial 5.5% improvement likely resulted from a Hawthorne effect (in which individuals modify their behaviours in response to the awareness of being observed82), amplified by LCHC’s organisational focus on hypertension. The subsequent 5.9% improvement likely resulted from implementing the multicomponent hypertension care pathway, specifically the first three pathway steps where we observed broad adoption: (1) check blood pressure accurately, (2) recheck blood pressure if elevated, and (3) diagnose and treat hypertension correctly. Given only partial adoption to date, it is not yet clear what the full effect will be of implementing step 4 (coach lifestyle changes while sharing the care with other team members) and step 5 (outreach if blood pressure is above goal or has not been checked within the last 6 months). Though much work remains to be done, our results to date demonstrate that as a group, nearly 200 LCHC clinical staff changed their approach to hypertension and sustained that change over 14 months. Failure of top-down interventions (often designed by senior leaders or improvement specialists without meaningful engagement of front-line staff) due to incomplete understanding of the root causes of the problem and perceived disrespect. ‘Copy/paste’ thinking which expects to replicate processes and results from one context and organisation to another. In this case, failure to understand and adapt to the nuances of the second context leads to divergent (usually worse) results. Aiming for easier, better, faster and cheaper, but out of sequence. Front-line staff resent the emphasis on bottom line savings ahead of making the work intuitive, efficient and safe. Morale suffers and the effort founders in the implementation phase. Lean principles—properly understood and incorporated into an organisation’s thinking, behaviours and daily processes—can enable healthcare organisations to deliver extraordinary value to their patients, create meaningful and well-remunerated work for employees and accelerate health system transformation towards the quadruple aim. Lean thinking may be a particularly good fit for FQHCs who, like LCHC, face the existential crisis of achieving care transformation with limited resources and without the necessary cash flow to absorb 1–2 years of losses before investments in care redesign materialise into financial savings. LCHC was able to accomplish important first steps in care transformation without external funding or additional staff. Others may be able to benefit from our experience—not to replicate the specific steps, but rather to develop the capability for lean thinking in their people and thereby reduce both uncertainty and risk in embarking on systemic change. Our study has several limitations. We have not demonstrated durable results beyond 14 months. If our organisational focus wavers, our processes may degrade, and performance may regress towards baseline. Since part of the hypertension care pathway has not been fully implemented across all teams, we are unable to estimate the effect of the full pathway on hypertension control in our patient population. Despite these significant limitations, we believe our results are generalisable to the extent that the problems we faced are widely shared among FQHCs and the approach to engaging staff and applying situational lean thinking and SPC would likely be successful in other FQHC contexts. There is a proven way to achieve the quadruple aim: the situational use of lean principles to engage and empower people in scientific problem solving. The challenge is developing capability for lean thinking while avoiding the pitfalls of top-down interventions, copy/paste thinking and aiming for easier, better, faster and cheaper out of sequence—and then finding the courage to persist. We embraced lean thinking 3 years ago and successfully began the journey towards improving population health at lower cost. We invite other FQHCs, health system leaders and policymakers to take a closer look at the principles, relevance and potential impact of lean thinking in resource-limited settings. We thank our patients and the many colleagues who contributed to the design and implementation of LCHC’s Hypertension Care Pathway. We thank Lloyd Provost for his review of our SPC analysis and Paul Barach for his review of our final manuscript. We also thank Norifumi Kamo and Kim Pittenger at Virginia Mason Medical Center in Seattle, WA and the Lean Enterprise Institute in Cambridge, MA for their insights and support.
. Income inequality, primary care, and health indicators. J Fam Pract 1999;48:275–84. Institute of Medicine. In: Lewin ME , Altman S , eds. Health Care Safety Net: Intact but Endangered. Washington, DC: The National Academies Press, 2000:308. National Association of Community Health Centers. Strengthening the Safety Net: Community Health Centers on the Front Lines of American Health Care, 2017.
. The role of public clinics in preventable hospitalizations among vulnerable populations. Health Serv Res 2001;36:405.
. Ambulatory care sensitive hospitalizations and emergency visits: experiences of Medicaid patients using federally qualified health centers. Med Care 2001;39:551–61.
. Kaiser Family Foundation. Community Health Centers Kaiser Commission on Medicaid and the Uninsured. 2009 https://kaiserfamilyfoundation.files.wordpress.com/2013/01/7877.pdf.
. Community Health Centers in an Era of Health Reform: An Overview and Key Challenges to Health Center Growth Executive Summary Kaiser Commission on Medicaid and the Uninsured, 2013.
. Community Health Centers and the Evolution of Medicaid Payment Reform. 2016 http://www.commonwealthfund.org/publications/blog/2016/oct/community-health-centers-medicaid-payment-reform (accessed 28 Dec 2017).
. Coverage Expansion and Delivery System Reform in the Safety Net: Two Sides of the Same Coin. 2017 https://catalyst.nejm.org/safety-net-coverage-expansion-system-reform/ (22 Jun 2017).
. Can States Survive The Per Capita Medicaid Caps In The AHCA? Health Affairs Blog 2017 (published Online First: May 17 2017).
. Taiichi Ohnos Workplace Management: Special 100th Birthday Edition: McGraw-Hill Education, 2012.
. Toyota Production System: Beyond Large-Scale Production: Taylor & Francis, 1988.
. The Toyota Mindset: The Ten Commandments of Taiichi Ohno: Enna Products Corporation, 2017.
. Kaizen: Lost in Translation February 7th, 2016. 2018. cited https://www.linkedin.com/pulse/beyond-toyota-continuous-evolution-tps-kaizen-jun-nakamuro/.
. Beyond Toyota - The Continuous Evolution of TPS and Kaizen. 2018 https://www.linkedin.com/pulse/beyond-toyota-continuous-evolution-tps-kaizen-jun-nakamuro/. Lean Enterprise Institute. What is Lean? 2000 https://www.lean.org/WhatsLean/ (accessed 9 Jul 2017).
. Toyota Kata: Managing People for Improvement. Adaptiveness and Superior Results: McGraw-Hill Education, 2009.
. Improving healthcare with control charts: basic and advanced spc methods and case studies: ASQ Quality Press, 2003.
. The Health Care Data Guide: Learning from Data for Improvement: Wiley, 2011.
. The patient flor physics framework. In: Sollecito W , Jonhnson J , eds. Continuous quality improvement in health care: theory, implementations and applications. 5th ed: Jones and Bartlett, 2017.
. Latest Starbucks buzzword: ’Lean' Japanese Techniques. Wall Street Journal 2009 https://www.wsj.com/articles/SB124933474023402611 (4th Aug 2009). The lean journey at the Boeing Company. ASQ World Conference on Quality and Improvement Proceedings: American Society for Quality, 2005.
. Transforming health care: Virginia Mason Medical Center’s pursuit of the perfect patient experience: CRC Press, 2012. Health Resources and Services Administration. Health Center Profile Lynn Community Health Center 2016. 2016 https://bphc.hrsa.gov/uds/datacenter.aspx?q=d&bid=011430&state=MA (accessed 16 Oct 2017).
. Bending the Medicaid cost curve: Massachusetts is betting big on accountable care organizations. 2017. Common Wealth Magazine. MassHealth Partners with Six Health Care Organizations to Improve Member Care. 2016 http://www.mass.gov/eohhs/gov/newsroom/press-releases/eohhs/masshealth-partners-with-six-health-care-organizations.html (accessed 13 Sep 2017). McCormack. Blood Pressure Medicines for Five Years to Prevent Death, Heart Attacks, and Strokes. 2014 http://www.thennt.com/nnt/anti-hypertensives-to-prevent-death-heart-attacks-and-strokes/.
. ThedaCare: Center for Healthcare Value: Strategy Deployment Healthcare Value Report . 2011 https://createvalue.org/wp-content/uploads/Strategy-Deployment_TCHV_withQRC.pdf.
. Getting the Right Things Done: A Leader’s Guide to Planning and Execution: Lean Enterprise Institute, 2006.
. Lean Enterprise Institute I. Lean Lexicon: A Graphical Glossary for Lean Thinkers: Lean Enterprise Institute, Incorporated, 2014.
. Non-Stock Production: The Shingo System of Continuous Improvement: Taylor & Francis, 1988.
. Lean thinking. New York: Simon and Schuster, 1996.
. e2 Continuous Improvement System: (Managing & Sustaining your Lean Transformation through the "e2 everybody, everyday" Approach to Lean): GBMP, Inc, 2010.
. Kaizen Express: Fundamentals for Your Lean Journey: Lean Enterprise Institute, 2009.
. The roots of lean. Training Within Industry: The Origin of Kaizen, Association for manufacturing Excellence, 2002:14–23. Standard work from a lean theory perspective. Annual Conference of the International Group for Lean Construction, 2008.
. Measuring Quality Improvement in Healthcare: A Guide to Statistical Process Control Applications: Quality Resources. 1995.
. Managing to learn: using the A3 Management process to solve problems, gain agreement. Mentor and Lead: Lean Enterprise Institute, 2008.
. The Toyota Kata Practice Guide: practicing scientific thinking skills for superior results in 20 minutes a day: McGraw-Hill Education, 2017.
. Toyota Kata Culture: building organizational capability and mindset through kata coaching: McGraw-Hill Education, 2017.
. Lean evolution: lessons from the workplace: Cambridge University Press, 2006.
. Work that makes sense: operator-led visuality: Visual Thinking Incorporated, 2011. Centers for Disease Control and Prevention. 2017 Million Hearts Hypertension Control Challenge Challenge.gov. 2017 https://www.challenge.gov/challenge/2017-million-hearts-hypertension-control-challenge/ (accessed 11 Apr 2017).
. Limits of Lean — Transformative Care Redesign Must Go Beyond Typical Lean-Based Improvements. NEJM Catalyst 2017 (published Online First: 5 Feb 2017). Contributors PL, LP, SO, KE, EF, TR, AR, JR, DS, VA, KKB, AL and KM contributed to the planning and implementation of the work described in the article. PL and LP wrote the manuscript with support from TR. PL, LP, SO, KE, EF, TR, AR, JR, DS, VA, KKB, AL and KM reviewed drafts and approved the final manuscript for submission. PL is responsible for overall content of the manuscript.